Axis Network Speakers are complete high-quality audio systems in a single unit. They’re perfect for background music and for live and scheduled announcements in stores. AXIS C1004-E Network Cabinet Speaker and the AXIS C2005 Network Ceiling Speaker makes audio smart and easy, and opens up a wealth of new possibilities. These speaker systems are perfect for background music and for live and scheduled announcements in retail stores. AXIS C1004-E comes in a choice of black or white and can be mounted horizontally or vertically. Splash-proof construction means it can be installed under the eaves, where it's not directly exposed to rain. The slim design of AXIS C2005 means it blends in nicely with its surroundings and a spring-based installation method means it can be easily flush mounted. 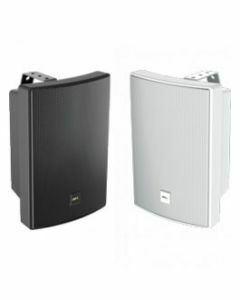 AXIS C1004-E and AXIS C2005 Network Cabinet Speakers are a complete high-quality audio system in a single unit. There’s no need for an amplifier, mixer, digital signal processor, streaming functionality, microphone or power supply because they're all built-in. And because it’s preconfigured, you don’t have to be a sound expert to set it up. In other words, it simply works – and sounds great – right out of the box. Plus, a built-in auto speaker-test function means you can be confident it will keep on working. The speaker connects to your existing IP network and it’s powered over a single Power over Ethernet cable. Since AXIS Network Cabinet Speaker is a network solution, it can be combined into a flexible and scalable system where it is easy to add or remove speakers in an instant. By creating zones to address a number of speakers at the same time, it is possible to direct different background music, or live or scheduled announcements, as well as control and change the volume for each unit individually and simultaneously. This way you can send your customers the best music and most efficient messaging to the right place, at the right time. AXIS Network Cabinet Speakers can run onboard applications – such as music streaming. You can also create and schedule local playlists that can be stored on an SD card directly on the speaker system. Schedule your announcements to inform your customers about opening hours or share your latest campaign. Announcements can be triggered by events captured by a surveillance camera, such as someone passing an exit the wrong way. You can also easily make live voice announcements, such as help needed at cash out. Our AXIS Audio Player application is pre-installed on AXIS Network Cabinet Speakers. It has support for streaming sources and everything you need to schedule playlists with music and announcements. And like all Axis products AXIS Network Cabinet Speakers is based on Axis open platforms (VAPIX and AXIS Camera Application Platform, ACAP). That means you’ll have access to the new applications being developed by our partners all the time.